"This is an issue of vast scales. I strongly recommend this film as an instructional tool to connect ecology, communication, and global service. Plastic Paradise engages students by illustrating how their everyday interactions with plastic are connected to pollution at the farthest, most exotic corners of the world. Students will learn the unexpected economic and ecological facets of plastic pollution and ways for each of us to minimize our plastic footprint. Angela Sun provides an excellent model of how one curious person can use her talents to follow her interests, speak from the heart, and contribute to improving the world. The voyage she completes can motivate students to discover more about pollution of all kinds on their own. By doing so, this film will inspire young people to act as global citizens and contribute to finding solutions for the major environmental problems of the coming century." "Highly Recommended...Accessible...Plastic Paradise covers a lot of ground in just under an hour, and is a great introduction to a range of important contemporary issues - material streams, corporate environmental responsibility, environmental activism, toxins and human health, ocean ecology - told from a simple, inquiring point of view." "Sun's Michael Moore-like tactics seem well-suited to the subject of a dangerous, yet all-pervasive product that is in every aspect of our lives...An alarming environmental activist film, this is recommended." "Accessible and interesting...The film makes a great effort to connect people with the consequences of their plastics use and disposal thereby sending a powerful message to the viewer to personally eliminate single-use plastics and to support the elimination of dangerous organic compounds such as BPA." "A very effective film that engages the viewer...Does an excellent job of connecting the dots about the human need for the indestructible material and the indelible impact plastic has on our environment." "With California's landmark single-use plastic bag ban stalled by manufacturers, it's a particularly apt time for this documentary...This gently presented but ultimately deeply concerning film should be shown at every school in the country to spare the next generation from environmental death by plastic. We owe is to our kids to give them this information." "Filmmaker Angela Sun tells a compelling story about the plethora of harmful impacts associated with non-degradable plastic, particularly in regard to the marine environment, while recognizing that the properties of plastic have enhanced our quality of life in many ways. The film's haunting message highlights the importance of society transitioning to the existing truly biodegradable polymers wherever possible and as soon as possible." "Viewers will not think of plastic in the same way again...Sun delivers a succinct and attention-getting message in this excellent, chilling film that will both support science curricula and appeal to popular interest." "I believe that this film portrays the state of the plastic marine debris issue accurately. Once in the ocean there is really no way to get it out, other than hope that it washes up on a shore and is collected. Then what? Recycle, bury, what to do with it? The big problem is that it is all about money, profits. To the best of my knowledge there has been no life cycle analysis of plastic. Even if there was, how do we put a price on an albatross? A dead seal or sea lion? An endangered sea turtle? This is one of the easiest visualizations of how humans (not all, but many) have lost connection with the environment--a sad state of affairs--but the truth." "A fun and well-balanced introduction to a complex environmental topic. Drawing from the expertise of a diversity of scientists, activists and management practitioners in the field, this film introduces its audience to issues regarding plastic production and waste-management, plastic contamination in the ocean and the hazards of plastic and its chemical cocktail to humans and wildlife." "Powerful...Sun's investigations should help make students and adults more aware of our casual overuse of plastic and its consequences." "Plastic Paradise offers new and sharpened perspectives on the problem of plastics in the environment. It includes a good history of the genesis of the plastics industry from materials shortages during World War II, and demonstrates that things put in the environment (such as a message in a bottle) can stick around for a long time and move great distances. This film makes the case that the only solution is source control, and that consumers have a great deal of underutilized power." "Angela Sun has found a way to present the imminent dangers of plastics pollution in a jarringly visual and inquisitive format...Significant take-home messages include a misconception of just how few plastic products are recyclable, and that plastics production will continue to increase as long as the demand for plastic products remains. The film takes a refreshing approach of avoiding the blame game, while emphasizing that learning about the issue can lead to less plastic use by the general public." "Angela Sun spoke with all the right people and even went to places she wasn't supposed to go in order to present the full story on plastic pollution. The film is excellent--in its timeliness, its depth, and its presentation. I watched the film with some of my students so I can attest that it appeals to the younger generation. 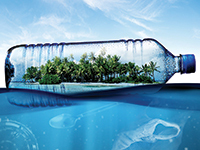 Plastic Paradise makes the issue of plastic pollution real and relevant. It provides valuable information and presents that information in an engaging and visually gripping way." "We are all familiar with trash, but most of us likely are unaware of indestructible plastic trash that pollutes the oceans, contaminates our seafood, kills birds, fish, and marine mammals as well as carrying toxic substances into the environment and our bodies. Plastic Paradise is an excellent, accessible, and troubling documentary that reveals these issues. My college age son thinks it is 'right on.' See it and share it with others!"